Now parameters are accepted and can be stored to the database. Hope this tips will be helpful. First, please excuse me if I make writing mistakes. I’m French and my English level is not very good. Next, your library is pretty cool, I have been using it for 2 days and I discoverd a lot of things. BUT, I have a little question : How can I do to sort my photos, using your “shift” option without leaving empty cells. For example, in this page, if you move the “J” down, you will have an empty cell between “I” and “K”. @Yohan – REDIPS.drag is upgraded to version 4.7.4. If shift_after public property is set to always then content will be shifted in your case as well. New feature is shown in this example also. 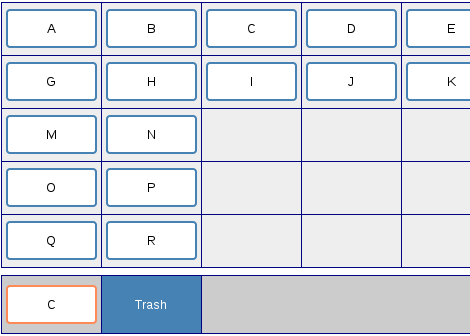 Just check “always” radio button and try to move “J” element to empty table cell. Am loving the script, am using example 13 as base of what we are doing. Am having difficulty in finding out how to align objects so that they align horizontally instead of vertically, so that they wrap onto next line when table cell fills up. Could someone explain where I can find the settings for this? First of all, this library is awesome and you are the man. Quick Question though. I have been working on one thing for a few days that I can’t figure out. I know that may be a problem if there are multiple DIVs in the last row, but my table has enough columns where that shouldn’t be an issue…Or maybe the top/bottom DIV moves left. Again, all DIVs shift left until there are no open TDs in each row. Is there a relatively simple way to do this? @Thomas – horizontal2 mode treats rows separately. If content should be shifted in whole table then try with horizontal1 mode. The similar modes are vertical1 and vertical2 (content is shifted verticaly). Next, DIV elements are shifted cell by cell. But you can create custom shifting with shift_cells(td1, td2) method. td1 and td2 are source and target table cells. Sorry for wording the problem poorly. I just meant if horizontal2 is turned on, and I was to take DIv B and place it in say (row 4, column 4) , C,D,E,F in row 0 would shift to the left to fill in the gap, and B would shift in row 4 to the left until it came to another DIV, or R. No Gaps would ever be left in rows. I got it working using shift_cells and a loop that starts at the final column of each row, and works its way to the left shifting any cells that have an empty cell to “the left.” If there is a shift, it jumps back to the right most column and starts again. The only problem I am having is that the animation is awkward from the looping, so I am turning it off during the loop. Sometimes the contents of the cell can shift multiple spaces to the left. Maybe I can fix it with move_object and/or relocate. Also what event can I use that will start my loop AFTER all of your standard animated shifts happen? @Thomas – Thanks for detailed info. Lib is updated with new event handler. So, in REDIPS.drag version 4.7.6, you have myhandler_relocated() event handler. This event handler is triggered after animation is finished in shift mode (actually, myhandler_relocated() event handler is called from relocate() method). If animation is turned off, then new event handler will not be called. Hope this will help. If you will still need assistance, I will gladly help. Thanks again for your help Darko. The problem was I thought that shift_cells(td1,td2) only shifted adjacent cells, rather then the range of cells. Looping through adjacent cells caused the animation to get a little whacky. For anyone else interested, here is a simple starting point so that “gaps” in your rows close themselves, and everything shifts left in its row while horizontal2 is on. @Thomas – Thank you very much for posting a solution. Your JS code will surely be helpful for others. Cheers! How may we save the position of the above Table2 example? I would like to save the position to database. Can it be done? with your example above? If too much work, you may charge if you need. Once more, Thank you sir. From this info it’s possible to get DIV position and prepare data for saving to database. how can i disable shift and allow multi DIV in cell ? I wonder how could I integrate many example in 1 example ,in addition for that I want to add event when i drop item into table .